One especially encouraging story is about a young girl whose family history would have expected her to become a shepherdess to help tend the sheep and goats, like her predecessors. The school in Quesimpuco at the time only went to 2nd grade…enough to teach the kids some basic reading and writing. But the leaders of the village asked SIFAT to help them educate the children, and SIFAT supporters built and staffed a Christian school where kids had a chance for a real education through 12th grade. The young girl, Ruth Noemi, was a very strong student and graduated first in her class. They saw great potential in Ruth, who wanted to learn more and help her people. SIFAT arranged support for her to attend college and then medical school. Dr. Ruth Noemi is now working in Quesimpuco at the clinic and traveling all around the region to serve her people. Being a female doctor is especially important, since she specializes in supporting women’s health issues that normally don’t receive proper attention. Two years ago, Mt. Bethel’s team donated a special medical backpack that is stocked with items useful in the remote areas of the region. Twenty years ago, Nicolas’s wife was in labor for three days because of complications and was near death. Without medical care available, this was, unfortunately, too common. One of the first Auburn UMC medical teams happened to be in Quesimpuco, and Nicolas sent for help. The team’s doctors immediately went to Chigmu and saved his wife’s life. He became a believer as he saw Christianity in action. He and Patricio began reading the bible that was given to them. They got to Leviticus 26:1, “Do not make idols or set up an image or a sacred stone for yourselves, and do not place a carved stone in your land to bow down before it. I am the Lord your God.” Nicolas and Patricio realized that they had been worshiping false idols! They tore down the stone idols that originally made Chigmu famous, and Patricio became the Christian spiritual leader for the village. His nickname is Idol Slayer! Later, God answered their prayers for clean water when they joined their former rival, Quesimpuco, in a water project, which has had a huge impact on the general health and well being for both villages. This guide has photos of the local people like Benjo, Dr. Ruth, Patricio and Nicolas, so you can see the faces of these brave first-generation believers. Their testimony and seeing the Gospel alive is part of the reason we keep going back to Quesimpuco, where we get to see genuine faith and joy in knowing Christ. I am sorry for such long-winded updates, but I can’t help but want to share as much as possible about these people and this place that has made a huge impact on my personal relationship with Christ. Cassimiro’s family farms in this area, and there is a grove of eucalyptus trees that makes a nice camping area. The trees were from seedlings given to Benjo’s father over 70 years ago. This is a beautiful place to see the stars, enjoy a campfire and hear Benjo give his testimony. I haven’t told you much about Benjo Parades in my updates, but he is the reason that we go to Quesimpuco. You need to ask your loved one to share what they learned about Benjo’s journey–starting from his birthplace in Quesimpuco to the jungles of Sapecho, where he became a Christian after meeting the Corson family. 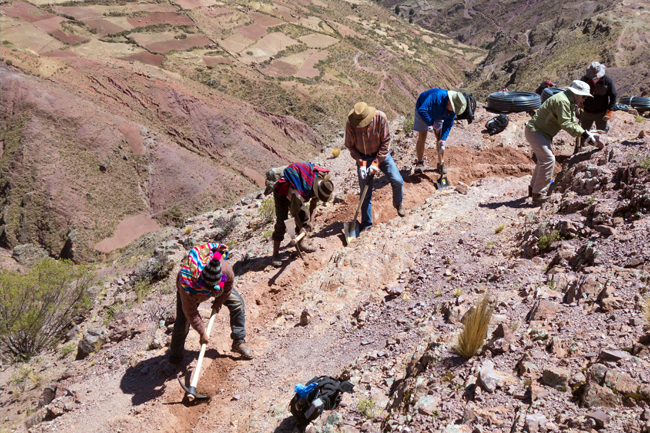 It is an incredible story of a man who once despised Christians and hated Americans, who was saved by faith in action that has resulted in thousands of people hearing the gospel in the remote mountains of Bolivia. To me, Benjo is a modern-day Paul. 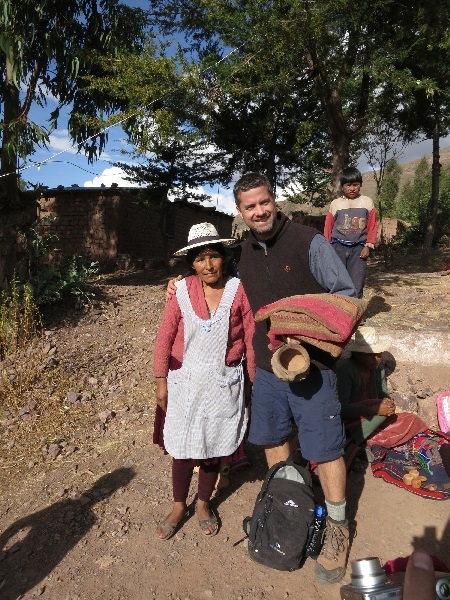 Benjo’s son Isaac is continuing the good work of improving the lives of the people in the remote regions of Bolivia, both in the mountains and the jungle. Sarah Corson’s book, Risking Everything is an inspiring account of the Corson family’s experience as missionaries in Bolivia and how they met and eventually saved Benjo for Christ. I highly recommend you buy a copy! Yesterday, was the last day in Quesimpuco, and the village hosted a “market day” for the team. Market day is held in a small grassy courtyard beside the cafeteria and outdoor bread oven, where people come to bring their handmade goods to sell. The Mt. Bethel men will have a chance to purchase some beautiful wool, ceramic and carved wood items, such as blankets, belts, bracelets, bowls, etc. The team participated in market day, where they were able to purchase handmade items from the local people of Quesimpuco. After market day, the village will host a small party with singing, skits and speeches where the leaders get to thank the team for their work, generosity and friendship. 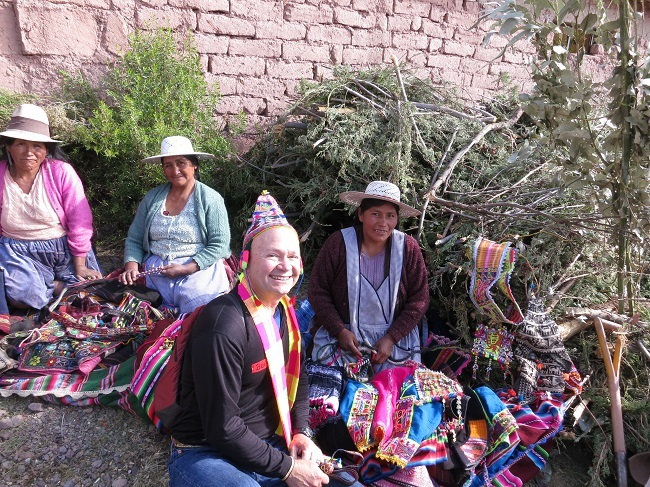 Gifts of traditional Quechua hats and scarves will be given to each of the men along with a final handshake and hug. Soon, the men will be saying goodbye to their friends in Quesimpuco. This morning, the team woke up at 3 a.m. to head back to La Paz. They leave very early to allow for an early afternoon arrival time in the big city and avoid the gridlock rush hour traffic. There is a good chance they will find an internet phone tonight or tomorrow and get to call home. The first hot shower in a week and a nice hotel room will be a real treat! Also, it is likely that they will head to Eli’s pizza down the street to eat a giant pizza. La Paz is a safe city to walk around and see the dynamic culture clashes between the old and new ways of Bolivia. We look forward to seeing the new pictures and hearing from the team soon!